a pretty lousy drug movie about a hollywood author who is addicted to heroin and allows it to destroy his life. Permanent Midnight is the first ben stiller – owen wilson movie. it’s the movie where these two guys met each other and became friends. unfortunately, this is the thing that is most memorable about the movie. both actors are comedians, only this is not a comedy. that might be the first clue that this movie is all wrong. the boys followed this up by making a number of movies together including meet the parents, zoolander, the royal tenenbaums and night at the museum. every one of them was a comedy and every one of them was a good film. but sadly, their first outing together was a bit of a mess. Permanent Midnight is perhaps considered a black comedy, although there is very little that is funny about it. it’s a movie about a junkie author who writes for tv. his name is jerry stahl (ben stiller), and he lives in l.a., focussing more on where he can get his next fix, than on his career. the movie begins with jerry and a woman named kitty (maria bello), sitting around in a hotel room, talking. he tells her his life story. the first thing we see is how he and kitty met, with jerry working at a drive through window of a fast food chain restaurant. she was a bit messed up too, when they met, going the wrong way to the window. and they hit it off and started seeing each other. that’s when jerry got into telling her who he was and how he had fallen this far. his telling of the story is really for our benefit, since this is the story we will be watching. only now we get to watch it with his voice-over narration jumping in every once in a while. the story starts with jerry out in l.a. as a successful television writer. 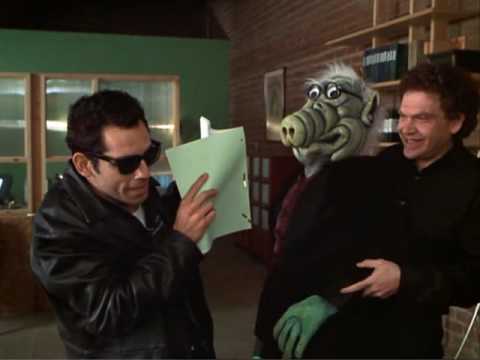 he’s written for one show that involves a green alien-like puppet, looking a lot like a version of alf. the show has done well, and other studios now want jerry to come and work for them. only he’s got this habit that he can’t seem to kick and doesn’t really want to either. we meet owen wilson, as jerry’s friend, and he introduces jerry to elizabeth hurley. that’s pretty much it for the wilson character. he’s in the first part of the movie, but after that he all but disappears, popping up one more time at a party later on in the film. elizabeth hurley’s character, sandra, is a successful television show producer. and she needs a green card to stay in the u.s., so she starts a fake marriage with jerry. they live together, and she tries to return the favor by getting him a job writing for a show that she produces. only he’s not the easiest person to vouch for, as she soon finds out. jerry goes to work for fred willard, the head producer where sandra works, and he’s a mess. right away he suggests getting rid of the puppet, which is the thing that made him. he wants to do a show that involves no puppets whatsoever. in fact, the puppet that he helped create, actually freaks him out. he is so high all the time that the puppet haunts him in some of his hallucinations. when the gig with fred willard doesn’t work out, sandra introduces jerry to a woman who will be his agent. it’s stiller’s long time friend, janeane garafolo, and she is very interested in jerry, despite his showing up so late to dinner that he only catches the girls as they are walking out of the restaurant. for some reason, this agent character likes jerry, and instead of being cool about that, he keeps brushing her off. at a party where he runs into her again, she asks for five minutes of his time, to talk with him, and he just laughs and walks away. this is basically the pattern of the movie. there are no great breakdown scenes, or memorable scenes at all. this is one of those movies, like a river runs through it, that was clearly based on a real person and that real person’s memoirs, and so as a result, there is no embellishing at all. there is no trimming or altering the story to make it more cinematic. and that’s a mistake. the most exciting thing that happens in this movie is two junkies shoot up and then go jumping into windows of a large building, knowing that they will bounce right off and just fall to the floor. as the movie goes on, jerry gets another writing gig where it is the star of the show who is in charge and really likes him. but she insists that he clean himself up, and when he doesn’t he loses that one too. it’s fun to watch jerry in the interviews / meetings with these people, trying to pretend like he is sober as he sits in the chair all rolled up like a ball. by the end of the movie we do find out what caused he and sandra to go their separate ways. she has a baby and jerry is put in charge for one night. what was sandra thinking? i like how the movie starts and ends with maria bello, since she is the aftermath of all of this, but the filling of the story leaves a lot to be desired. the movie is extremely uneventful. there seems to be potential around every corner, yet very little of it is explored. for example, the janeane garafolo agent clearly likes jerry. it would have been nice to see them have an affair and to see her try to help him get cleaned up. but this movie refuses to veer away from what really happened to the author, and since it is based on a book that was written by the author himself, the man wants to stat true to his own story. it might have felt like a hell of an experience to him, but that doesn’t mean it works for the screen. we’ve seen much better movies about people losing themselves to drugs, from trainspotting to boogie nights to gridlock’d. permanent midnight is a movie that adds nothing new to the genre.